Egypt’s ousted president Mohamed Mursi was sentenced to death by a Cairo court on Tuesday for accusations of escaping from the Wadi al-Natroun prison. Also sentenced to death are Muslim Brotherhood Supreme Guide Mohamed Badie, his deputy Rashad Bayoumi, and leading Brotherhood figures Saad al-Katatny and Essam El-Erian. The former president and 128 other defendants are accused of collaborating with international bodies, the Palestinian Hamas and Lebanese Hezbollah, to escape prison during the January 2011 uprising that toppled former President Hosni Mubarak. The judge presiding over the trial said the court is certain “beyond reasonable doubt” that this case involved defendants from inside and from outside the country, during the session which was aired live on state television. This case includes 27 defendants who were tried in session and 102 sentenced in absentia. In total, 99 defendnats were sentenced to death, six of whom attended the session, while the rest were sentenced in absentia. The remaining 30 defendants were sentenced to varying prison sentences, ranging from 27 to two years. The sentences come after the case was referred to Egypt’s Grand Mufti on May 16, a procedural step adopted by Egypt’s courts before sentencing defendants to death. 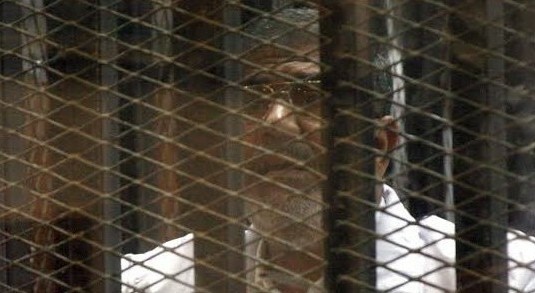 This is Mursi’s third conviction to date. Earlier on Tuesday, the former president was sentenced to life in prison for an espionage trial by the same court. His first conviction was in April when he was sentenced to 20 years of maximum security prison for charges of show of force and detention associated with physical torture of protesters during deadly protests in 2012. Mursi, who became Egypt’s president in June 2012 after the first democratic elections in the country, was eventually ousted at the hands of the military following mass protests against his rule, after a year in power.